Starting this week, your Twitter feed is going to look a lot different. In their infinite wisdom, the social media titan has decided that their media previews should now be expanded by default in their web interface and iOS app. (You can disable it in the iOS app, but not on the web.) So if someone links to an image, you now get a Facebookesque image embedded in the tweet. Ditto for those silly looping videos from Vine. I have a problem with this. A change, even one so deceptively small as this, can drastically alter how a social networking site is used. Look at Facebook, for example. I don’t know about you, but my feed is an endless sea of images, with a rare plain-text status. It’s gotten to the point where if you want to say something and be heard, you have to set your text on a picture. Otherwise people will just scroll right past it, the visual noise drowning out the text. Photos, image macros and paragraphs of (frequently trite) text needlessly pasted into graphics that add next to nothing to the message. A compact and scannable feed of short messages. The “stream of consciousness” that Twitter is famous for. Interesting things that don’t quite merit their own full-length blog posts. Links to long form articles recommended by the people I follow. The addition of embedded media will be to the detriment of Twitter. It will encourage more image links and, potentially, tweets that solely consist of an image. 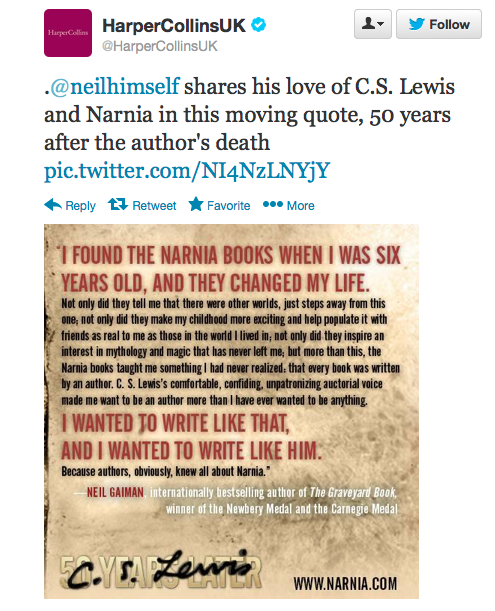 I don’t even follow @HarperCollinsUK, it was retweeted, and I’m certainly not a C. S. Lewis fan. But here’s the same kind of junk, straight out of Facebook, showing up already. 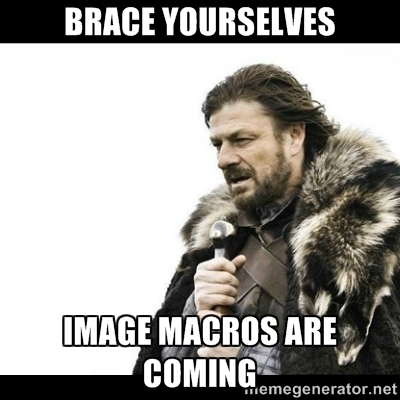 I guess it’s time to brace yourselves, because the image macros are coming. I don’t think it as a bad idea indeed. I love the new twitter. Ugh. I’m not in love with it at all. If I want Facebook or Tumblr, I’ll go there. Memes, Vines, & Photos … Oh my! thbbt!